Please click on the ELS19 tab at the top of this page for full details of this event. Looking for a Registered Exercise Professional in Nova Scotia? Check out our Provincial Registry! Payment plans can be arranged for those who need one. Please contact us at info@nsfitness.ca to arrange a payment plan before you register. مرحباً بكم في رابطة نوڤا سكوشا للياقة البدنية. برامجنا التعلمية معتمدة، كما اننا نقوم بورش عمل للتعليم المستمر. نقوم بعمل مؤتمرات كل عام للتثقيف حول اللياقة البدنية. نوفر تأمين صحي لحماية الطلاب خلال تواجدهم في أماكن الدراسة. برامج رابطة نوڤا سكوشا للياقة معتمدة في جميع انحاء كندا مما يجعل الامر سهل في تحويل ساعات الدراسة الى رابطة أخرى في مقاطعة إقليمية مُختلفة. برامجنا التعليمية معتمدة على النطاق الدولي ايضاً. 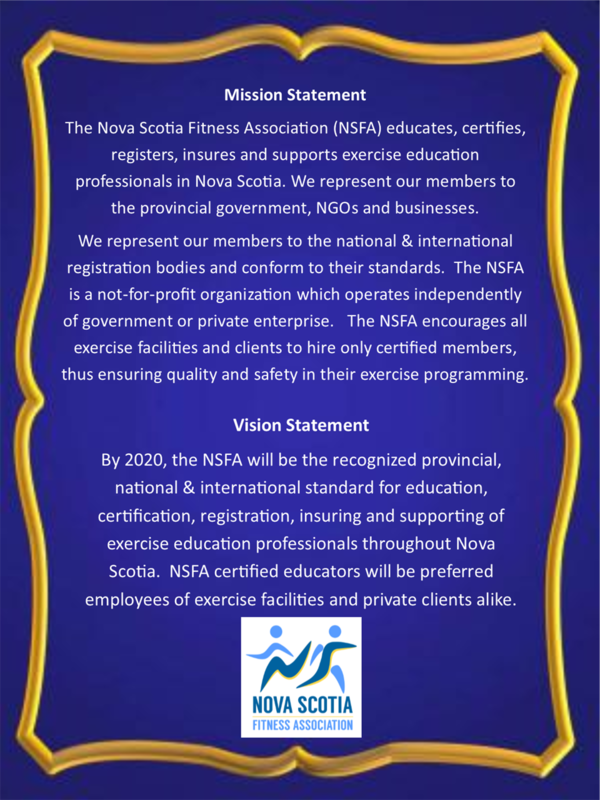 The NSFA was formed in 1989 to provide Nova Scotians with a clear standard for evaluating the quality of fitness leadership in the province and to promote professionalism in the industry. As a not-for-profit organization, the NSFA is an unbiased source of fitness education and certification. We teach certification courses, offer continuing education workshops and an annual conference, provide insurance and liaise with national and international exercise registries on behalf of our members. 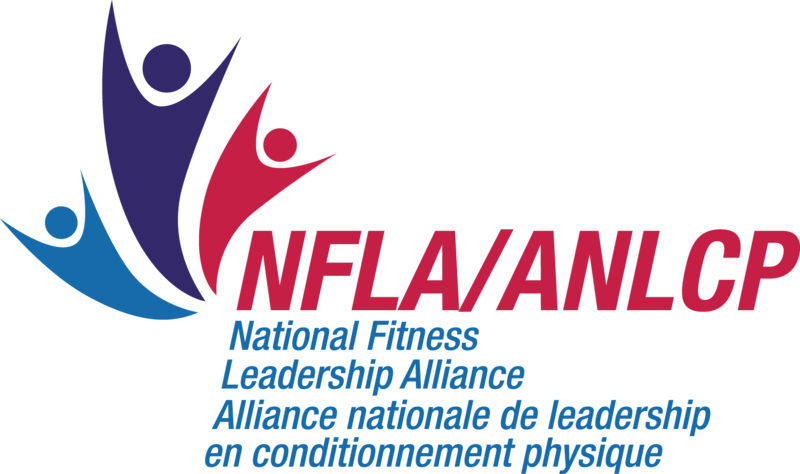 The NSFA is a member of the National Fitness Leadership Alliance (NFLA) of Canada. The National Fitness Leadership Alliance of Canada is a partnership of not-for-profit organizations dedicated to the advancement of exercise accreditation and leadership. NFLA Canada is dedicated to the promotion of active living for all Canadians. We do this by providing a variety of community-based services, education, accreditation and an unbiased transparent and standardized registration program to exercise professionals. NFLA represents Canadian exercise professionals in The International Confederation of Registers of Exercise Professionals (ICREPs) which is an international partnership between organizations responsible for registration of exercise professionals around the world. NSFA certifications are recognized nationally and are transferable to any province/territory in Canada. They are transferable internationally to fellow ICREPS member nations. Please visit our Colleagues & Sponsors page for more information and links to NFLA & ICREPS. All Regular members of the NSFA are transferable within the NFLA & ICREPS. NSFA Associate members are not transferable as they do not have NSFA certifications. Make fitness part of your everyday life! Why do younger people like virtual platforms so much and how can we get (and keep!) them in our classes?